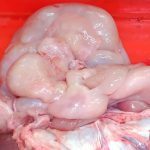 In a male, 6 months old, pig carcass, multiple whitish nodular lesions were observed in the lungs, parietal pleura, diaphragm and in the liver. Although teh appearance was not of caseous necrosis the inspectors suspected of a tuberculosis case. 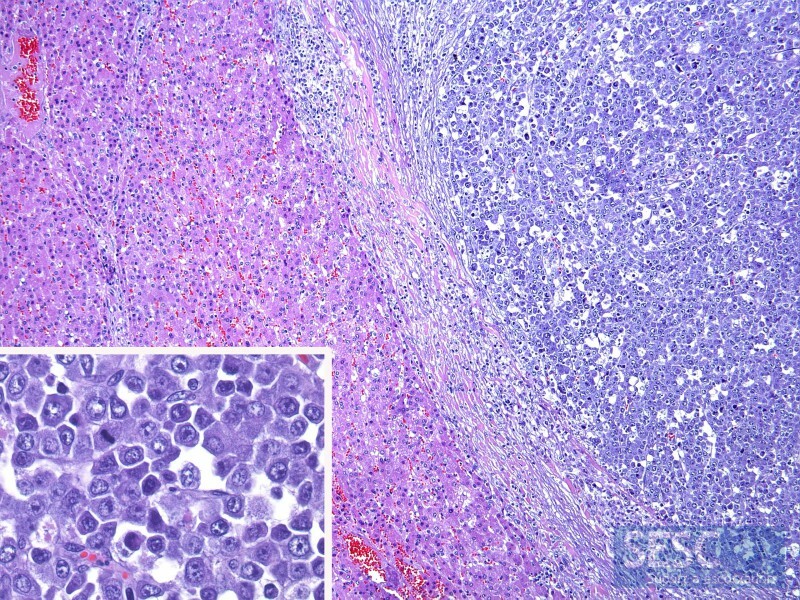 The histopathological study showed that it was a malignant round cell neoplasia: lymphosarcoma. 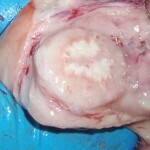 In pigs, tuberculous lesions have a proliferative nature, rather than necrotic and, macroscopically, may resemble the aspect of a neoplasia. Therefore, it was necessary to rule out that it was an outbreak of tuberculosis. 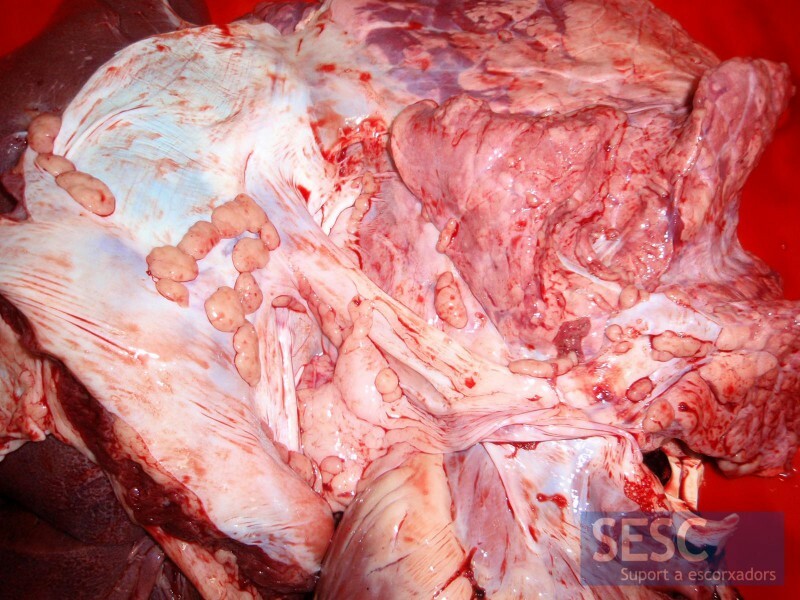 Tuberculous lesions in pigs can be caused by mycobacteria within the M.tuberculosis complex and M.avium. Whitish nodular lesions in the parietal pleura and lung. Whitish nodular lesions in the liver. Image of Histopathology of the liver showing a proliferation of round cells (upper right, bluish). At higher magnification (inset) one can observe neoplastic cells. 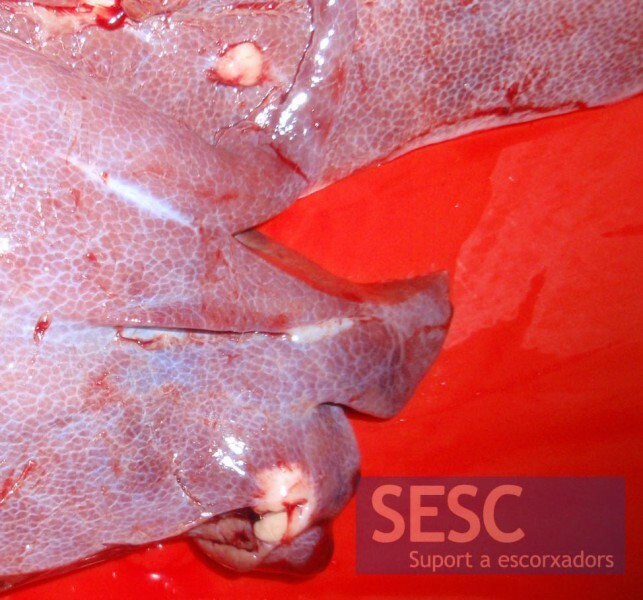 This entry was posted by SESC on 03/11/2014 at , and is filed under Abdominal cavity (porcine), Liver, Neoplasia (porcine), Porcine. Follow any responses to this post through RSS 2.0.You can leave a response or trackback from your own site. Then the suspected origin of the infection was the feed fed to the animals, which was the dame in the different farms that has cases. 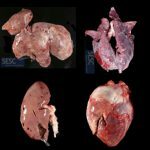 There has been a recent conversation within some swine veterinarians in the US, about pigs being condemned at slaughter with similar findings to this case you have posted. Apparently, the inspector at the plant determined that the animals had lymphosarcoma. Further testing done by the company’s vet has shown that the swollen lymph nodes correlate to PCV2 diagnosis. Other vets suggested that M. avium could be playing a role, introduced by birds getting in contact with the pigs in the barn. Definitely, different diseases to be considered and a good reminder to keep our eyes and mind open.